In gradID, the first three terms of our curriculum are highly structured. For this reason, it’s imperative that entering students complete the first three terms before taking one off. 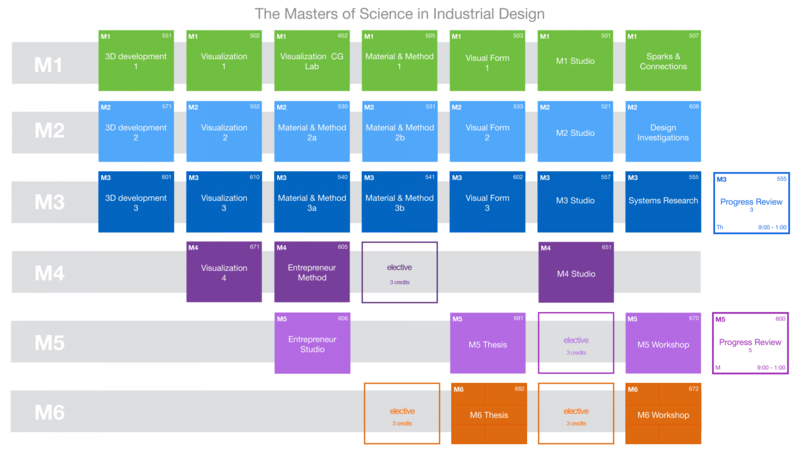 In fact, most students complete the first four terms without a break, as the fourth term usually focuses on a studio project sponsored by an industry partner. During the first three terms, electives are available but not recommended, due to the demanding workload from the required daily classes. During the fourth term, one elective is required. During the fifth term, two electives are required. The selection of electives is at the discretion of each student, and many choose to take classes from our varied undergraduate curriculum. After the fourth term, students typically customize their program according to their individual goals. Options include taking a term off to work as an intern—we strongly encourage our students to secure an internship in either or both the fourth or fifth terms—or participating in one of our exchange programs, such as the INSEAD—ArtCenter Business program in France or Singapore, where students from both colleges bring their design strategies and business concepts together. Focuses on research, business and design theory, as well as the development of process, visualization, prototyping and communication skills using new tools and methodologies. Students work individually and in teams to apply Level 1 skills in projects, including industry-sponsored projects. Students define and execute an individual thesis project that demonstrates their understanding of the program’s methodologies as applied to a topic of their choice.